More important, the political fight didn’t start with the protests in Madison last week, nor will it end. Governor Scott Walker was no political neophyte, and has spent much of his political career promoting austerity and attacking labor–regardless of the political or economic climate. Critics have been quick to point out that he cut a series of business taxes as soon as he took office, and that the limits on collective bargaining would have no effect on the state’s fiscal situation. He was reluctant to waste the crisis of the state budget when he could stretch that crisis to go after labor. When labor went into the streets and activated union networks, others with grievances joined in, including students opposed to higher tuition, and some people who appreciated the services they received from teachers, police officers, firefighters, nurses, and clerks at the Division of Motor Vehicles. To extend the political moment, fourteen Democrats in the state senate took off–apparently for Illinois. They lacked the votes to defeat the Republican majority, but they could deny it a quorum. Although this isn’t a common strategy, the Wisconsin Democrats were hardly the first. For the Wisconsin senators in hiding, this was clearly an effort to give their allies time to get their case out and build support. It prevents their opposition from moving forward. It could lead to compromise and negotiation in the Senate, but the effects outside the State House are likely to be much greater. Once the media were filled with reports of colorful protests of working people, their opponents fought back. Americans for Prosperity, a key group in the Tea Party’s infrastructure (discussed here), founded and funded by the Koch brothers, took out web ads and started a site to support Governor Walker. 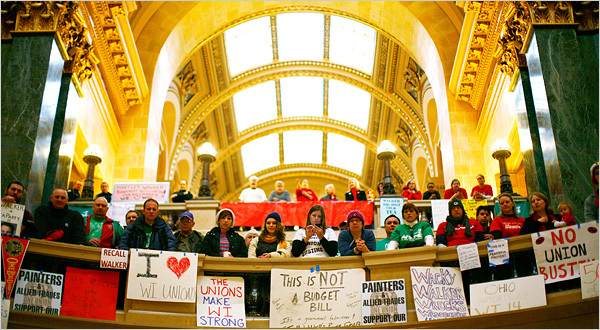 (Mother Jones reports that the Koch brothers were behind the attack on collective bargaining in the first place.) AFP is using the crisis to build organization and mailing lists. Even as organized labor has continued to decline in America, there are still more unionized workers than, say, people who would be affected by a modest estate tax or a higher tax rate for people who earned over $250,000. But neither plutocrats nor organized labor are terribly popular in America. What happens next is all about which side is able to mobilize other constituencies. Are parents concerned about the education of their children more likely to be sympathetic to their teachers or more outraged at the prospect of taxation? The answer is going to shape politics in America for a long time. This entry was posted in Uncategorized and tagged coalitions, countermovements, Koch Brothers, labor, protest, Wisconsin. Bookmark the permalink.